I woke up just really wanting a doughnut. It just sounded good and it sounded like a fun family outing. But I literally had to beg the kids to go, then finally just force it upon them. It was then an there I realized they don't really know what doughnuts are. Obviously we don't get them enough! Don't get me wrong. Connor used to know what doughnuts were. He would even ask for them all the time. Back then (like a year or so ago) I used to go get them on an almost daily basis. And I was totally gaining weight and didn't understand why!?! So the almost daily doughnuts and the daily froyo trips stopped. I can't believe that I was packing on the pounds either!? Well the pendulum seems to have swung in the opposite direction. Maybe doughnuts should be like a once a month excursion. Or at least every other month. Or maybe once a week...I kid. I seriously have no self restraint when it comes to food. Come on guys, it's a genetic thing! My dad doesn't either! 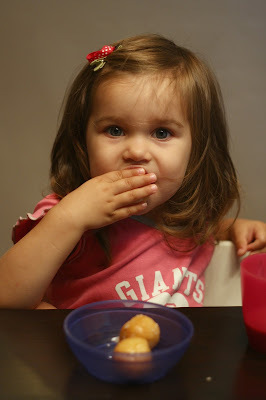 Donuts happen about bi-monthly in our house. There is a donut shop literally two blocks away so it's serious selt-restraint not to go more often than that. Landon always insists on a donut with sprinkles and then only eats the frosting off the top too!